Last night I got a plastic bag full of 45’s from Dirk Koorn, again. And in that bag were a pile of Reader’s Digest flexi’s, again. And again I just placed them on the shelf, with the rest of my Reader’s Digest collection. 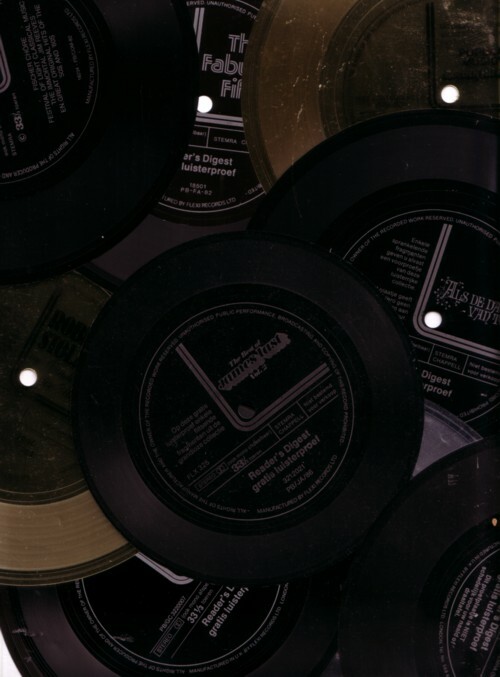 I have no idea how many Reader’s Digest flexi’s I have (I haven’t even found the courage to sort out the double records) and neither do I have any idea how many flexi records were ever made by Reader’s Digest, but it sure is far more than any normal human being can handle. These flexi records came in envelops with a lot of information on the LP-boxes that they advertised for. I collect these envelops and al the information too, of course. I don’t collect all of the LP-boxes. My parents had a few, and they were not as bad as you might be tened to think. And some of these boxes are even good, like the Ted Heath box for example. But in most cases I rather keep it with the advertisement flexi’s. 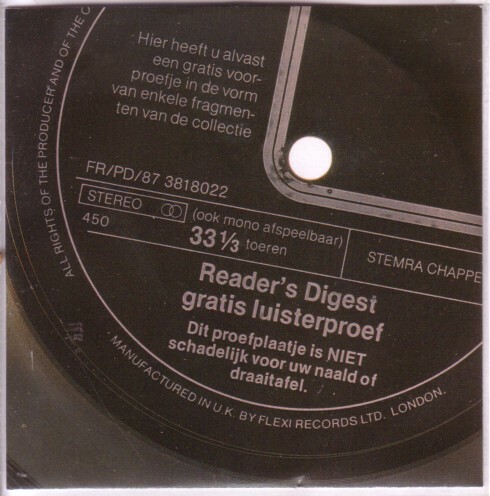 I have many ideas of what can be done with the Reader’s Digest flexi’s: montages, cut-up’s, mixes, mash-up’s, etcetera. But there are so much better things to that I doubt that I will ever get to it. These records are absolutely the lowest-of-the-lowest. That is what makes them interesting, of course. But you have to be in a very very special mood for it. And please notice the subtle mixing that has been done for this record! I own about fifty of them, but there must be way more. One day I would like to make a list of all the Reader’s Digest flexi’s. Retirement? You are not that old, are you? But i would like to buy that book. I have 14 collectors edition Readers Digest vinyl album sets from the swing era, Bing Crosby, Glenn Miller, 1939-1945 collector sets and much more. They are all in mint condition with original boxes. I would like to sell them to someone who would appreciate them. 2018. There is always more. I now have 318 flexies by Lyntone, Flexi records, SFI etc. and 47 by Sonopresse Holland (including pressings for Denmark, Sweden, Austria, Germany etc).